Weather is fickle. Radio antennas are fussy little machines, too. 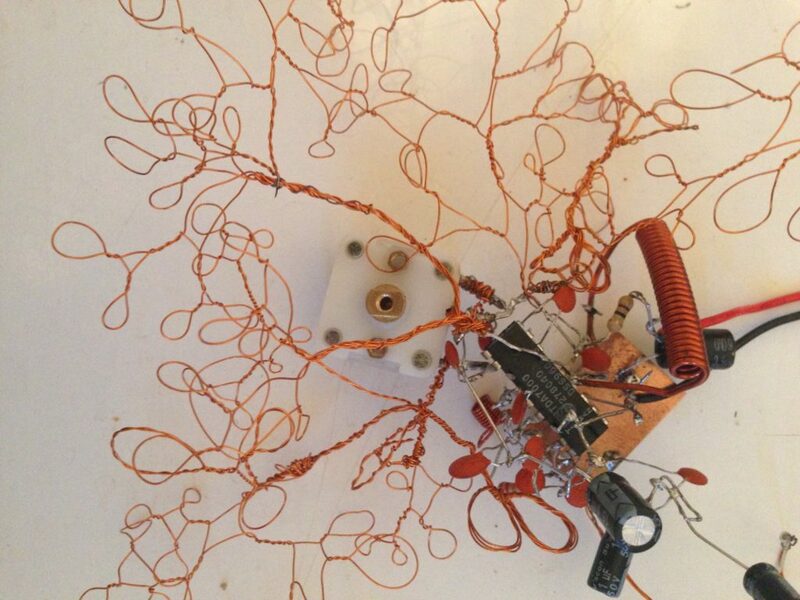 Mollye Bendell makes digital and analog sculptures to connect with digital and analog worlds. 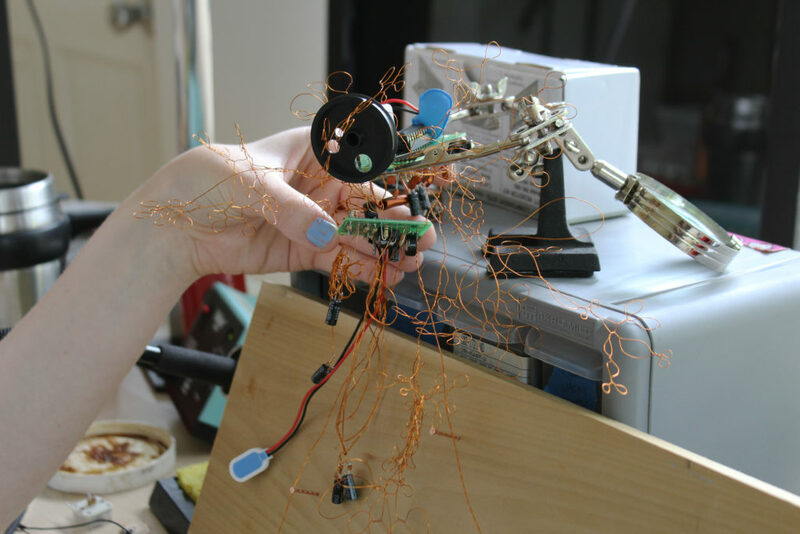 Her work uses the intangible nature of electronic media as a metaphor for exploring vulnerability, visibility, and longing in a world that can feel isolating. Whethervanes plays inside these spectral spaces. The project consists of a series of experimental radios in which components such as the tuner and antennae are subject to the wind. Found and constructed objects including weather vanes, flags, sails, and windmills are used to manipulate different kinds of potentiometers and different antenna configurations. In summer 2018, Bendell’s artist residency at Wave Farm, allowed her to build and to mount her newly constructed radio antennas. They are barely faithful to the ‘signal’ being pulled towards these bows. “I’m just waiting for a spirit to reach me,” explains Bendell. Obvious technology yields to mysterious elements, reminding us of the 19th century advance towards Spiritualism. All you hear is static and a lot of wind. Joan Schuman/Earlid: Why are we curious about the ephemeral signal? What are we listening to in the disembodied entity that has always been inherent in the medium of radio? Mollye Bendell: I think people have always been fascinated by things that are real that they can’t touch. There’s something striking to me about the idea that it represents communication, or an attempt at communication, no matter what that communication is. Inherent in the signal is this idea of singularity: you only hear the message as many times as the signal goes out. But also a radio wave never truly decays, it’s just the wavelengths get too far apart to be sensed. This is something you can’t see, or touch, and can only hear for a short space of time but you can definitively prove it exists and never decays. I don’t know if we know that we’re fascinated by the ephemeral signal, I just know that I am. The tension between the definitiveness and the ephemerality is what’s fascinating to me. Mollye: The idea of toying with the weather was just something whimsical. I thought of the wind as somewhat analogous, in that you only feel it in the moment that it’s existing. It’s not really tangible or visible but you can prove definitively that it is there. As someone who was ignorant about radios I always wondered why radio signals weren’t affected by wind. I understood that they existed on a sort of different physical plain. It’s a different kind of physicality. But I thought there was something whimsical about the idea that weather would affect the radio. Before I started making these pieces I was experimenting with hobbyist electronics, and I really wanted to “touch the magic” so to speak. And so focusing on the physicality of those electronics became very fascinating to me as opposed to a means-to-an-ends mentality. After that, after I had built a few, I just started wondering how I could screw them up. In any electronic media, there’s a very fine line between working and not working. But it’s not a binary. There is a space where it’s “kind of working” and I got interested in that liminal space. The obvious progression is from analog to digital electronics, where it is a binary, literally, everything boils down to whether or not a signal is being received at the very core of it. But in my work I’ve always been interested in liminal space, in the non-binary, and this just seemed another way to experiment with liminality a little more. I guess you could say I progressed deeper into building things the wrong way. Joan: I’m curious about your experiences since you’ve built your antennas. Is there a surprise (success or failure) or tension in the very making and/or setting up of these ‘whethervanes’? How did it all start? Mollye: I guess it was one of those things where my mom is an electrical engineer so I knew that radios do not need many ingredients to work. It’s not like building a computer which is inherently a complex piece of machinery. You know, you had foxhole radios during WWII which were made of whatever could be found at that time, or crystal radios which are popular science experiments for middle schoolers (always marketed for boys, why). As an amateur I thought that if I could build a radio then I could understand a little about how they worked, and actually the opposite of that was true. They’re very finicky little things, they’re temperamental. Even though the components are few, it’s very hard to know what they’re doing and why they’re working. The liminality of the concept played out in the liminality of the mechanics. Joan: Is weather a huge factor? Mollye: As with everything with radios, yes and no (not yes or no, i.e. binary). The only reason that the wind affects the components of my radios is that those components are built so that if the wind hits them they will create electrical interference with one another. But the actual movement isn’t in theory doing anything. However, I have since learned that there are many weather-related things that do affect radios such as rain, day vs. night. So on a large scale if you want your radio station to work well you have to account for things like your signal being clearer in the night vs. during the day. I brought weather into it to make the radio a more realized undertaking, a more finished work. But if I was building a perfect radio the weather wouldn’t matter. But to those building a perfect radio the weather does matter. It all gets convoluted rather quickly. Joan: As I was reading your last ideas about how wind impacts the antennas, I was thinking about both the metaphor of wind and realities of any changing weather patterns (in some geographies more heat means more wind; more drought generates more wind, etc.). Did any of these ideas figure into your process? Mollye: I didn’t think as far ahead as the weather patterns going in, but it’s definitely something I’d want to consider in the future, especially considering how much time I’ve spent holding a homemade radio, walking around with it, trying to get it to pick up signal. It makes me think about how changing locations can change the output dramatically. In that way they become reflective of their specific location, or a representation of their specific location, like weather stations perhaps. In that train of thought they would be temporal as well because as the weather changes the sound of the radio will change as well. There’s also a way in which the electronics are not really protected in any way so over time the wind and the rain will degrade them. It sort of shows how sound and energy, even electronics or electricity, aren’t separate from the ecosystem but a part of it, like everything else. Almost like an organism they react to those changes. 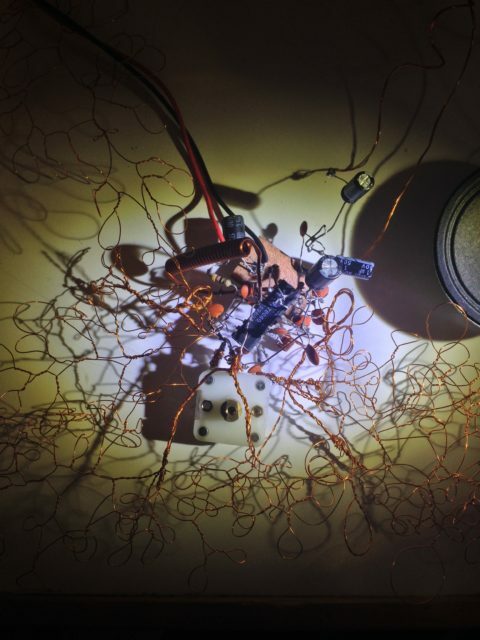 Explore more projects by Baltimore artist, Mollye Bendell such as Recorder, a shallow turntable spinning at 45 rpm in an inversion of audio recorded into sand.